Economic pressures and the consumerization of IT have led many companies to embrace smartphones purchased by employees for mixed business and personal use. But the regulatory, financial, and competitive consequences of data breach continue to grow, forcing employers to look for more pragmatic ways to ensure the safety of sensitive data on employee-liable devices, on far larger scales. 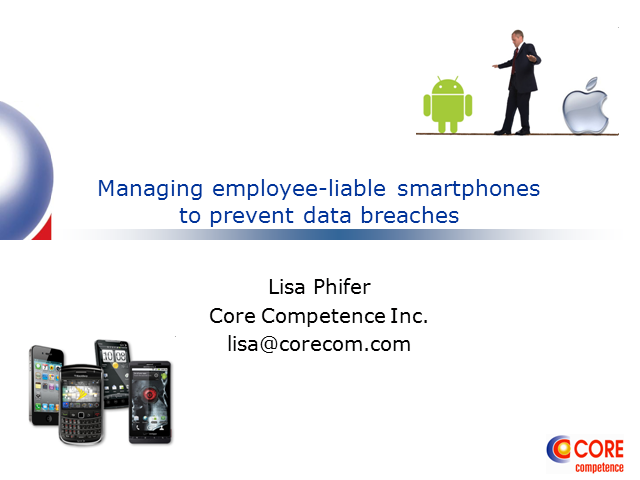 In this presentation, we consider practical limitations and technical gaps that employers must address to reap the benefits of employee-liable smartphones without escalating risk and how mobile device management can help. Lisa Phifer, President, Core Competence Inc. Presented by: Lisa Phifer, President, Core Competence Inc.